Common hawthorn is an introduced invasive shrub or small tree that originates in Europe, west Asia and North Africa (Phipps 1998). It was introduced as a garden plant in North America and is now present in western and eastern regions of the continent (USA: AK, AR, CA, CT, DC, DE, IL, KY, MA, ME, MI, MT, NH, NJ, NY, OH, OR, PA, RI, TN, UT, VA, VT, WA, WI, WV, CAN: BC, NB, NS, ON, PE, QC) (USDA 2010). In BC, common hawthorn is found on southeastern Vancouver Island and the southwestern corner of the mainland, with a few reports from the north coast and the Queen Charlotte Islands. It is frequently encountered in the Fraser delta and is invasive in Garry oak ecosystems on Vancouver Island where it can replace open sites with a dense shrub layer (GOERT 2002). It is locally common at Salmon Arm and Castlegar with sporadic occurrences elsewhere inland (Phipps 1998). This is generally an easily recognized medium to tall shrub species with distinctive simple lobed leaves, short stout thorns about 1 cm long, white flowers, and red fruit. Morphology can be variable, however, perhaps because of multiple origins and cultivars present in the area (Phipps 1998). The red fruits readily distinguish it from BC's other two species of Crataegus, which are black-fruited, although hybrids with the native black hawthorn (Crataegus douglasii) have been reported (GOERT 2002). The species is readily dispersed by birds. View a key to the hawthorns of the Pacific Coast (from Alaska to California) (with species notes) by Jim Phipps. Large shrub or small tree 2-10 m tall, with short stout thorns about 1 cm long; twigs greyish to reddish-brown, smooth; bark dark grey-brown, scaly. Alternate, deciduous, long-stalked, smooth except for patches of hairs on the veins beneath, egg-shaped in outline, the blades 1.5-3.5 cm long, deeply 3- to 7-lobed, the lobes usually reaching more than halfway to the midrib, few-toothed, the veins running to the sinuses as well as to the tips of the lobes. Berry-like pomes (like miniature apples), globe- to egg-shaped, 8-10 mm long, deep red; stones (nutlets) 1, 1-seeded. Moist to mesic disturbed places, thickets, forest margins and open forests in the lowland zone; infrequent in SW BC, rare inland and north along the coast; introduced from Europe. GOERT. 2002. English Hawthorn page. Garry Oak Ecosystems Recovery Team, Web site. Available Online. Phipps, J. B. 1998. 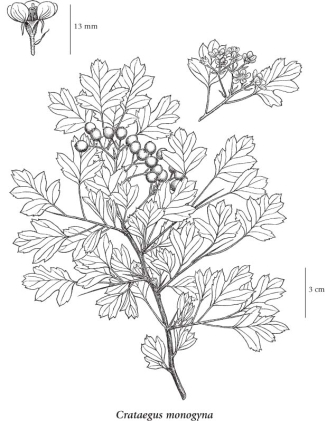 Introduction to the red-fruited hawthorns (Crataegus, Rosaceae) of western North America. Canadian Journal of Botany 76: 1863–1899. USDA. 2010. Plant profile for Crataegus monogyna. USDA Plants Database. United States Department of Agriculture. Available Online.